Conventional car enthusiast wisdom states the VW Jetta TDI is the thinking man's fuel-efficient car. Free of the complication, sacrificed driving dynamics and image of hybrids, it makes do with diesel instead. Largely due to GM's abortive efforts with diesel in the '80s, the fuel has an extremely negative image in this country. While thrift-minded Euros have looked no further for decades, most Americans associate diesel with clouds of black smoke, rattles, poor performance and unavailability at gas stations. This created the market gap for hybrids, re-branding fuel economy with technology too complicated for most people to understand and unique styling. The Jetta TDI seeks to put the kibosh on the rise of the hybrids by pushing traditional automotive values like performance, space, practicality and fun in a package that will still save its drivers money on fuel. Starting at just $22,270 for the sedan and $23,870 for the wagon, that's a $2,445 premium over the similarly spec'd Jetta SE. That puts it squarely in mid-spec 2010 Toyota Prius price territory, and is usefully cheaper than the $27,270 17" wheel-equipped Prius V that's actually decent to drive. Officially rated at 29 MPG city and 40 MPG highway, the Jetta TDI is considerably more frugal than the 21 city/29 highway Jetta SE. It's fun to drive too. Making 140 HP at 4,000 RPM and 236 Lb-Ft between 1,750 and 2,500 RPM meaning the engine's flexibility and day-to-day usability far outweighs its somewhat disappointing 9.5-second 0-60 MPH time (the sedan does the same run in 8.2 seconds). You can hold high gears on country roads, using fifth for everything from fast overtaking to 40 MPH corners. The chassis returns the classic VW values of complete competence, reasonable response and a fair bit more involvement than most would expect from a compact car. It's not going to set an enthusiastic driver's heart alight, but it would give the average hoon a worthy companion. Adding the wagon doesn't just decrease the acceleration and increase the price, it transforms the car form a less practical VW Golf/Rabbit/whatever they're calling it these days into something with a serious level of hauling ability for a relatively small vehicle. Seats down, it has 66.9 cubic feet of storage room; seats up that drops to 32.8 cubic feet (double that of the sedan) but creates space for two adults to sit in the rear in comfort with 35.5" of leg room, you could fit a third, pathetic excuse for an adult back there in a pinch. 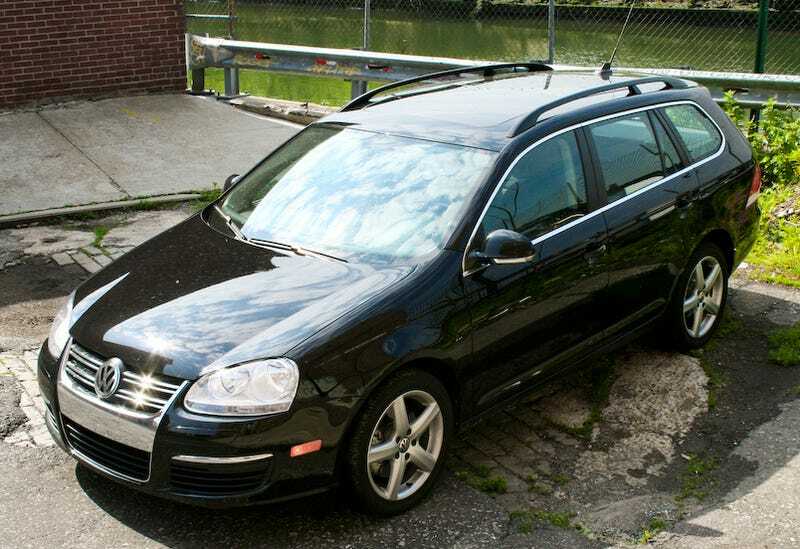 In Europe, the 2009 VW Jetta SportWagen TDI would be considered a spacious family car, it could be in America too as long as you believe in birth control and exercise. So far, the Jetta TDI makes a convincing case for itself as a do-anything, appeal-to-anyone fuel-sipper, but then you get to the gearbox. People that prefer driving stick need read no further, a standard is fitted as standard and its six speeds are well-spaced and fun to use. But only 6% of all cars sold in America have a manual transmission and this Jetta TDI doesn't come with an auto, it comes with a DSG and an odd one at that. In performance applications like the VW GTI or Audi TT, VW's DSG gearbox is rightly praised as incredibly quick to shift — just 8 milliseconds on a full-throttle upshift — and, when compared to a torque converter automatic, is very fuel-efficient, lightweight and loses virtually no power. Here, in the Jetta TDI, while driving fast it's no different except for the lack of paddles, manual shifting is done by moving the tunnel-mounted selector forward for up and backward for down. After driving many DSG-equipped cars it's weird not having the paddles, but you get used to it. It's while doing anything but driving fast that the DSG is problematic. Shift when the transmission's electronic brain isn't expecting it and the transition can take up to 400 milliseconds and is intrusively jerky. Leave it in auto mode, as most drivers are likely to do, and it's even worse. Upshifts come way too soon and too frequently, spoiling acceleration and overtaking ability, while downshifts don't come when expected and are, again, very intrusive, especially for the shift from 2nd to 1st. The DSG doesn't behave like an auto at low speeds, there's no creep and there's a comparatively huge amount of engine braking in 1st. Drive along at low speed, lift off the gas and you come to an abrupt halt, almost as if the parking brake has been left on. Sport mode is a little better, moving up and downshifts up the rev range a little bit, but it still doesn't allow you to exploit the full expanse of the power band like you want to in a car this flexible. As a test, I had my auto-only girlfriend drive the Jetta slowly down the private road her parents live on. The first time she lifted off the gas her response was "Ahhhhhh!" The DSG-equipped Jetta just doesn't behave like the average driver expects it to. Our fear is that the DSG transmission's jerkiness; unpredictability and poor manners will combine with the average American's negative perception of diesel to turn them away from buying the car. Sure, the Continuously Variable Transmissions, on/off engines and electric motors of hybrids result in an odd drive too, but not in a way that would upset the habits of casually careless drivers, in fact the Hybrid driving characteristics play into the "my car is so high-tech I don't understand what it's doing" mindset, the Jetta DSG is just annoying in comparison. That transmission makes it harder to make a case for the mainstream acceptance of the Jetta TDI over a car like the Toyota Prius. Even with the Jetta TDI's recent 48-state, 58.8 MPG Guinness World Record, the Prius still easily achieves more with an official rating of 50 MPG and hypermiling figures in the 60 and 70 MPG range potentially are easily achievable. Gas is typically cheaper than diesel too. The end result is a car that we really like, a car that can competently perform everything from people hauling, moving furniture and commuting to driving fast on mountain roads, all for a reasonable price and while returning really good fuel economy. It's also a car that we'd recommend people who'll get the stick should buy. But, the Jetta TDI, when equipped with the DSG transmission, just isn't a car that we think the average American driver will like. That's a shame. Average Americans, we mean.